My Buddy Tag provides a parent with electronic assistance to be Aware, Alert and Assured when out with a child. OUT OF RANGE alert, WATER SAFETY alert, PANIC BUTTON, LAST SEEN Location email and ID band. A lost child is a parent's worst nightmare. 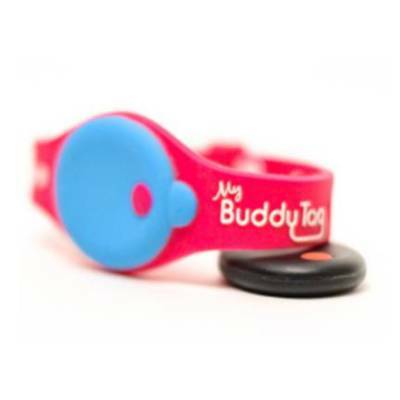 My Buddy Tag was developed in the USA to provide electronic assistance when out and about with a child. Utilising bluetooth technology, the My Buddy Tag works in conjunction with a mobile phone to monitor a child's whereabouts and provide appropriate alerts. What does My Buddy Tag provide? 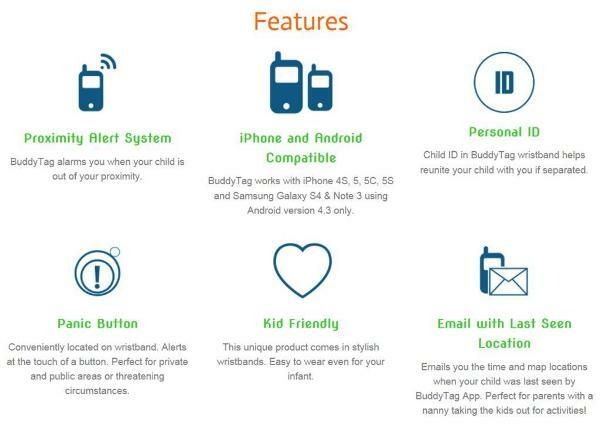 Out Of Range Alert - Buddytag uses bluetooth technology to send an alert when your child is out of your proximity (distance can be set by App user). Water Safety Alert - Buddytag alerts you when it is submerged in water for longer than 5 seconds to help prevent a drowning situation. Panic Button - Located on the wristband. Sends Alert to parent at the touch of a button. Personal ID - white strip under wristband to write a child's important contact details. Last Location Email - emails time and map locations when your child was last seen by the Buddytag App. 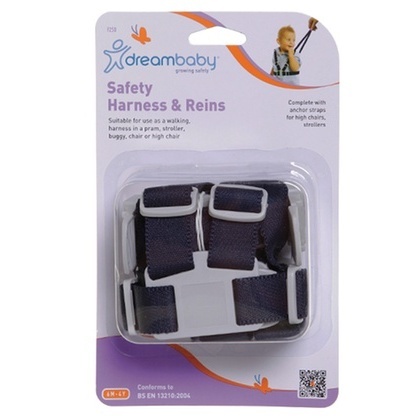 Perfect for parents with a nanny taking the kids out! Each package comes with a BuddyTag and Silicone Wristband. The Silicone wristband is comfortable and adjustable to fit most child’s wrist size (the wristband is 18cm long) and some younger children’s ankles. 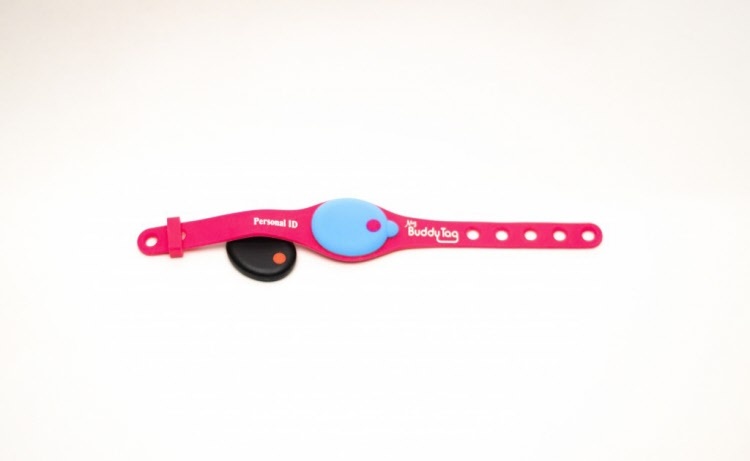 A coin-operated screw closure secures the silicone wristband on your child’s wrist to prevent accidental removal. The mobile app is FREE and there are no monthly fees. BuddyTag App is designed to work with the iPhone 4S, 5, 5C, 5S, 6, 6 Plus, 7 series; Samsung Galaxy S3, S4, S5, Note2 and Note3 with Android version 4.3 or newer. BuddyTag is also compatible with the 4th Generation iPad, iPad Air, iPad Air2, iPad Mini, and the 5th Generation iPod Touch. What is the range of BuddyTag? How long will my BuddyTag device last? The battery inside BuddyTag should last for over a year under normal usage. Normal usage is defined as you turn on and connect BuddyTag to your phone when you are out and about with your child, and disconnect to turn off when you arrive home. The battery is not replaceable because Buddy Tag is sealed to make it waterproof. How do I initially set up my BuddyTag? How does the latest Water Safety Alert feature work? When BuddyTag is submerged in water about a foot (30cm) deep or deeper, such as a pool, lake or ocean, the signal from BuddyTag will be attenuated. Our app on the phone will see the signal attenuation, and it will sound the out-of-range alarm. When you are near water, you will want to treat all out-of-range alert as possible water safety alert, and take prompt actions to make sure your children are safe and sound. Since BuddyTag uses Bluetooth signal strength for detection, our app can’t distinguish if it is out of range or if it is in water; therefore, please treat all alarms as possible water safety alert if you are near water. Will the panic button continue to alert me on each time it is activated? Yes, every time your kid press the Panic Button. Our App will sound the alarm on your phone and vibrate. (If your phone is muted, then it will just vibrate.) At the same time, it will pop up a message on your phone specifying your child needs you. Why did you choose Bluetooth Technology instead of GPS? Can you connect to more than one BuddyTag? Yes, you can connect to as many Buddy Tags as you want, if you have a Brady Bunch! You can also customize the name of each BuddyTag in our App, so you know which BuddyTag is who. Blue 10 pack of disposable identification wristbands including a water resistant marker and resealable pack.